The financial system of Côte d’Ivoire does not play the financial intermediary role it should. Commercial banks own three-quarters of the financial sector assets and generally give only short-term loans, the study finds. Only 6% of bank loans are allocated to the agricultural sector and most of them to big processing groups and groups of exporters. 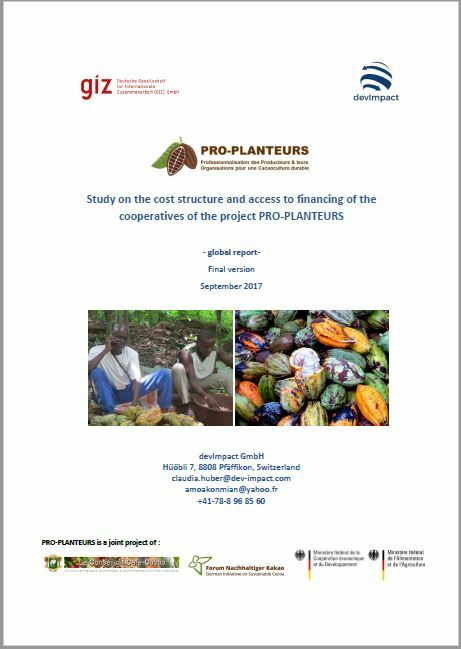 The study analysed the possibilities and conditions for cocoa cooperatives to access financing from the private sector and looked at the financial and operational structure of 10 selected cooperatives from the PRO-PLANTEURS project. What were their possibilities to access funding through financial institutions in the short and medium term, taking into account the potential offer in financial services? The analysis also sought to identify the type of support needed by these 10 cooperatives to be eligible for funding. A combination of several methods was used for the analysis to verify and triangulate the obtained information. Quantitative and qualitative data were collected through semi-structured interviews with different actors, including cooperatives, financial institutions, public authorities and other industry and funder projects. 15 different types of financial institutions, commercial banks, micro-finance institutions, credit and savings cooperatives but also social investors were included in the analysis. Côte d’Ivoire is the biggest producer of cocoa beans, with a market share of about 41% and an estimated production of 1.98 million tons in 2016-2017. Its economy has grown by 10% in the recent years. Though, small cocoa producers do not benefit from this growth and 72% of them live below the poverty line. 800,000 to 1.3 million small farmers run plantations of 1.5 to 5 hectares on average, supporting eight million people. Cocoa certification plays a considerable role, with over 500,000 tons cocoa certified in 2015. However, a reduction of the demand in certified cocoa has been observed, depriving cooperatives (and producers) of an important source of income. Since the reform of the sector in 2012, the price of cocoa has been defined by anticipated auction sales. The farmgate price has now been set at 60% of the CIF value. Whilst the farmgate price has been increasing continuously over the last years – a trend that was exacerbated by the problems experienced in the sector since the beginning of 2017 –, the farmgate price was fixed for the intermediate crop season period at 36% below the price of the previous crop season. This development has had negative impacts on cooperatives and their members and also potentially on the financial institutions that finance the sector. Only about one quarter of farmers are organised in cooperatives, facing the fierce competition of intermediaries. In nearly all cases, the volume of cocoa collected by PRO-PLANTEURS cooperatives has been decreasing for the past three years (by over 50%). At the same time, in seven out of the ten cooperatives, the number of members has been increasing considerably since their establishment. Only two cooperatives experienced a reduction in the number of their members. However, women and youths remain largely under-represented. In general, PRO-PLANTEURS cooperatives show a relatively high turnover, with half of those cooperatives’ turnover reaching CFA 1 to 2 billion. All cooperatives closed 2015 with a positive net result. Eight out of the ten analysed PRO-PLANTEURS cooperatives hold certification from at least one standard, either Fairtrade, UTZ or Rainforest Alliance. All cooperatives provide their members and communities with social benefits. Nonetheless, the extent of those social benefits depends substantially on the volume of activities within each cooperative and on the level of premiums they receive. All cooperatives, except two, have benefited from pre-financing from a buyer for the latest crop season. This demonstrates the trust that buyers have in the cooperatives. Five out of ten PRO-PLANTEURS cooperatives contracted a loan, from a few million CFA to several million CFA, hence showing a level of experience that is well above the average of those of cooperative societies. 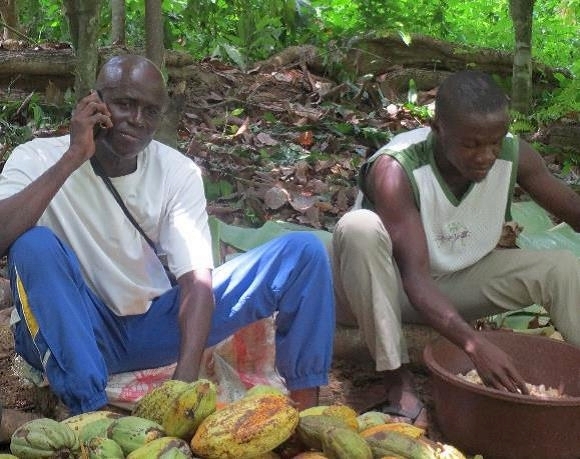 The project aims to professionalize cocoa cooperative societies in the Centre, South and East regions of Côte d’Ivoire reaching 20,000 farmer families, which is equivalent to about 100,000 people. Currently, the project is working with 18 cooperative societies in Aboisso, Agboville and Abengourou. The project was developed and funded through a collaboration between the Conseil du Café-Cacao (Coffee-Cocoa Council), BMZ, BMEL and the members of the German Initiative on Sustainable Cocoa (GISCO); implemented by GIZ. By emphasizing food security and improving nutrition through the diversification of production, the project particularly targets women and young farmers. It is in line with the national development project of the coffee-cocoa industry – “Quality, Quantity, Growth (2QC)” – and with the CocoaAction strategy of the World Cocoa Foundation (WCF). After starting collaborating with cocoa cooperative societies, a shortfall rapidly manifested itself with respect to the access to working and investment capital for cooperative societies. Without a large financing capacity, it is important for cooperative societies to have other funding sources to be able to grow and professionalise their business. Nevertheless, most of the financial institutions are reluctant to work with the agricultural sector, and specifically with cocoa cooperative societies and with small producers. Therefore meetings with other public authorities were organised for this study.